PerryPie's Nail Polish Adventures: Merry Christmas Everyone! Here is the obligatory Christmas mani. I did two, actually. After screwing the first one up so bad, I redid it Christmas day. I went with less Christmas-obvious for the second one. 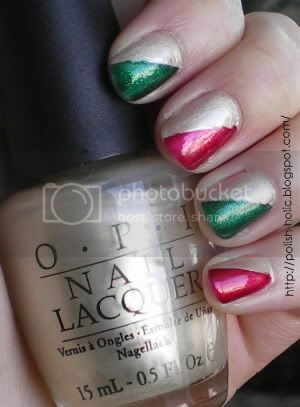 Base is three coats OPI I Only Drink Champagne with one coat of China Glaze Ruby Pumps or China Glaze Emerald Sparkle. I didn't wait long enough for Champagne to dry so when I peeled the pieces of sticker paper off, the polish peeled with it. So it just looks all gross and wrinkly. This is two coats of Zoya Lulu and one coat of OPI Up Front & Personal. I really need to get a back-up bottle of Up Front & Personal, I use it for everything. 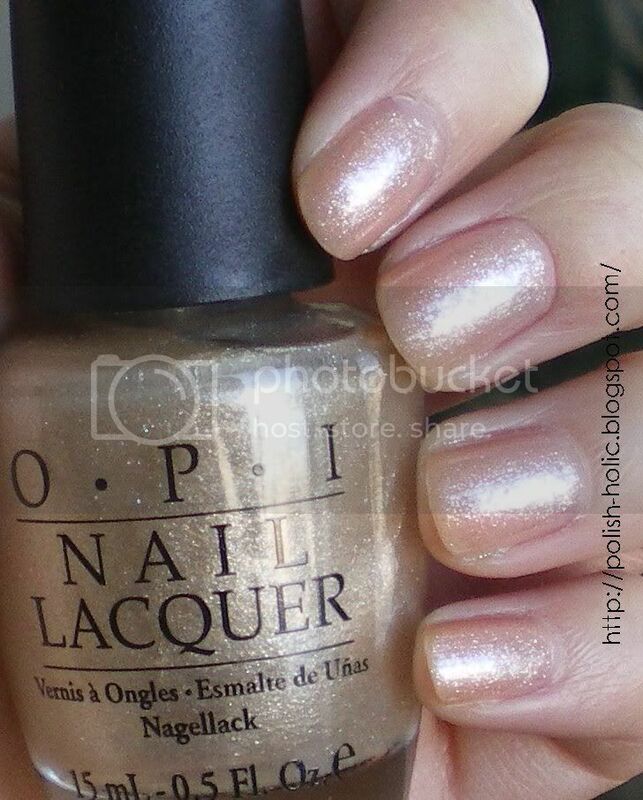 This mani is much more natural but still blingy and festive. I included a low light pic to try and show you the pinky peach of Lulu. I slapped Up Front & Personal on gold and it doesn't have anywhere near the type of impact as it does on just plain skin or a pink. Anyhow, have a very Merry Christmas everyone! May your holidays be bright and your New Year be awesome. 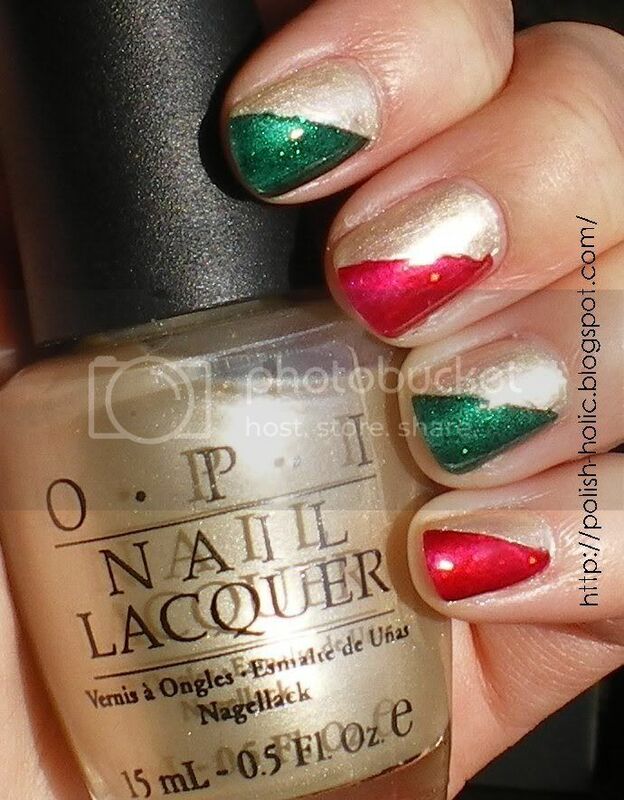 Remember, only one more week to take part in pick my polish. After the New Year I'm going to finish off the swatches and things will then go back to whatever I pick. BTW, I've added something like 30 new bottles of polish since I first started Pick-My-Polish, so for anyone who hasn't picked yet, there are more choices now. So gooooooooo. Edit: Here's a pic in artificial light. Here you can see the pink and green shimmer. Those are very pretty! Is it really cold in Calgary? My boyfriend's family is there now for the holidays.